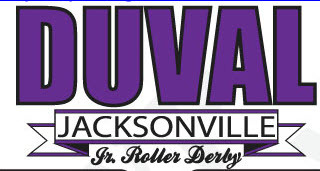 The Duval Roller Dolls are Jacksonville’s first and only junior roller derby team. Formed in January 2012, we have over 40 children age 8-17 learning the sport of roller derby. Junior Derby is the future of the sport, and we strive to create a positive and safe environment for kids to develop their athletic abilities, build self-confidence, leadership skills and teamwork, and improve their overall fitness. Our travel team competes in the All-Female Divisions. We also schedule unsanctioned B games for fun and to develop our newer skaters. We currently practice twice per week where we work on endurance, strategy, and skating skills. Check out our rostered skater list here.